Homeowner's associations don't have the best reputation for logic or adhering to democratic principles. Of course, every person knows that some zoning and other regulations are necessary. Most of us have our greatest capital investment in our homes. We want it protected, even if its through the agency of a homeowner's association. As an example of the depths of stupidity a homeowner's association can reach, we can point to a fellow in Colorado who ran afoul of his location home owner's association by flying the USA's original flag, the 13-stars-in-a-circle emblem. Silly business, every bit of it. I have a 13-star flag, and I flew it every day after the 9/11 terror attack. Why? I don't know. There was something about the revolutionary spirit, something about that gathering of reasoned defiance that appealed to me. I special-ordered it. And began to fly it. I vowed I''d keep it up until Osama bin Laden was brought to justice. And then Bush/Cheney/Rumsfeld invaded Iraq, and I took it down. I still have it, and we use it when we fly the national emblem. My admiration for the 13-star flag aside, I really hate to see the misuse of the "Don't Tread on Me" flag by the Tea Party, that loose group of Republicans, libertarians, and looneys. 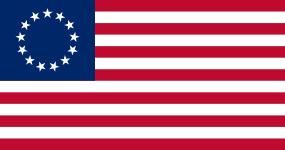 That flag has its place in American history -- as does the Confederate Stars-and-Bars -- but I'm not sure those who use it now operate in the spirit of those who carried it in the 1770s. Were I a member of a homeowner's association, I might vote for a ban on flying the Stars-and-Bars. Given the current divide-and-hate political climate, I can see myself voting for a ban on the "Don't Tread on Me" flag. But the 13-star flag? No. Yes, I know any ban is generally a restriction of free speech, but since the point of a homeowner's association is to preserve property values, I think the 13-star flag would be far, far less apt than the other two to have an adverse influence.